Hey there! I had a baby! Amazingly she’s already 10 weeks old. I’m so glad to be able to wear some of my handmade wardrobe again. Happy to say the maternity t-shirts I made have been getting plenty of wear. 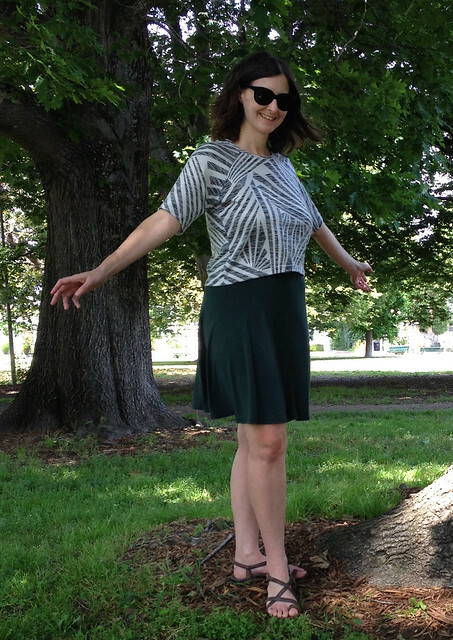 Here’s a favorite combo now that our weather is warming up: a Linden top and a knit half circle skirt. 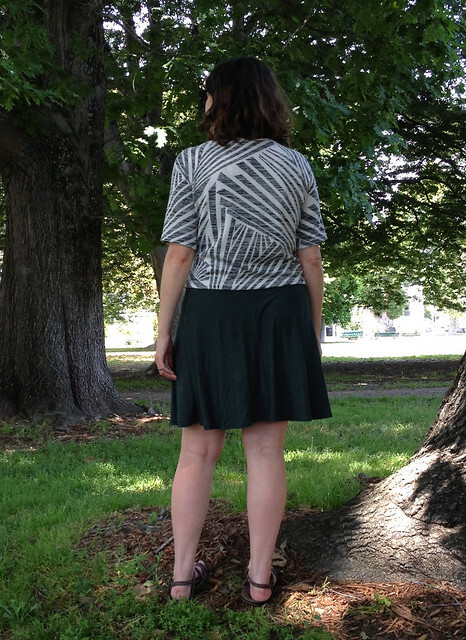 The Linden top is made from a printed knit from Stonemountain. I love the way the print works with the raglan sleeves. I’m tempted to try this pattern in a woven next – maybe a Nani Iro double gauze? The skirt is made from my favorite eco bamboo knit, also from Stonemountain. It is a little bit clingier than I would like but otherwise lovely. I used Megan Nielsen’s free circle skirt pattern to make the skirt but instead of a full circle I made a half circle. So, sewing with a newborn… Over the last few weeks I’ve sewn a t-shirt and cut out a skirt. Not the speediest sewing but it feels great to squeeze in a little creative time. Now I’m off to wait for the next elusive baby nap to put together my new skirt. You’re back!!!! YAY! And lookin’ great, too! I love this Linden top – I have been pondering whether I should try the Linden as a top, since I wear my sweatshirts to death – I think you just convinced me! Definitely try it! The best part is the sizing is just like the sweatshirt so no guessing about fit. Can’t wait to see yours! Congratulations! Also, that fabric is awesome and looks so cool with raglan sleeves. Very nice!